Hi. My name is Dobby and I’m writing today’s blog post. We had some serious rain today, and a waterfall magically appeared in the aviary, coming from the neighbor’s back yard. It oozed across my back yard, pooled up by my bathroom, and flushed itself away. Whoosh! Just like that. The water came and then it went away. The harness stuck on the picket and broke both of them. 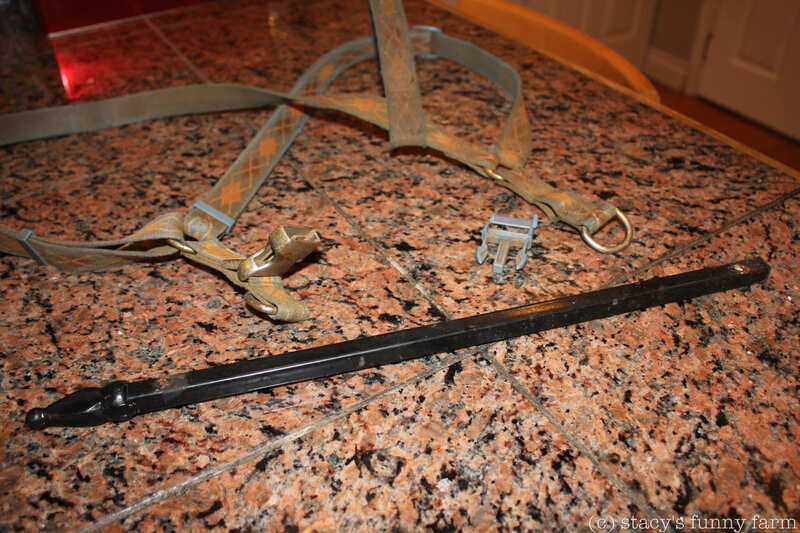 We had another exciting event recently: I broke my harness, and broke a fence, too! Super-Capybara! My super-power seems to be wrecking things. The blue plastic buckle broke, and the picket welds failed. My harness caught on the picket and I was running so fast I just broke the welds on the fence! I’m not sure why people think we are slow, lumbering animals. We are SWIFT! And CLUMSY! Not a very good combination. This is Grover, and we thought he was sick, but he isn’t now. We all have our ups and downs. 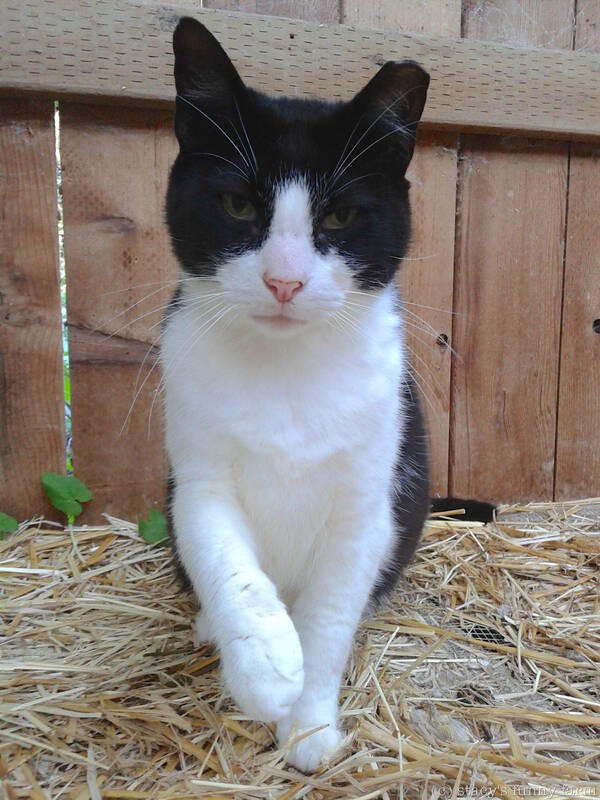 Kitty Hawk, also from the Seattle Alley Cat Project. They are both FIV+ barn cats. Kitty Hawk is just a downer. He wants to be held and petted CONSTANTLY, and that, of course, takes attention away from ME. Enough said. RIP sweet Madonna. We miss you every day. My hens, on the other hand, share their birdseed with me. I’m a little sad about that yellow one, Madonna. She isn’t here any more. Time to go to the front yard. Watch that birdseed for me, okay? Don’t let the chickens eat all of it. There is a snack bar on the way to the front yard, if you go the long way ’round. 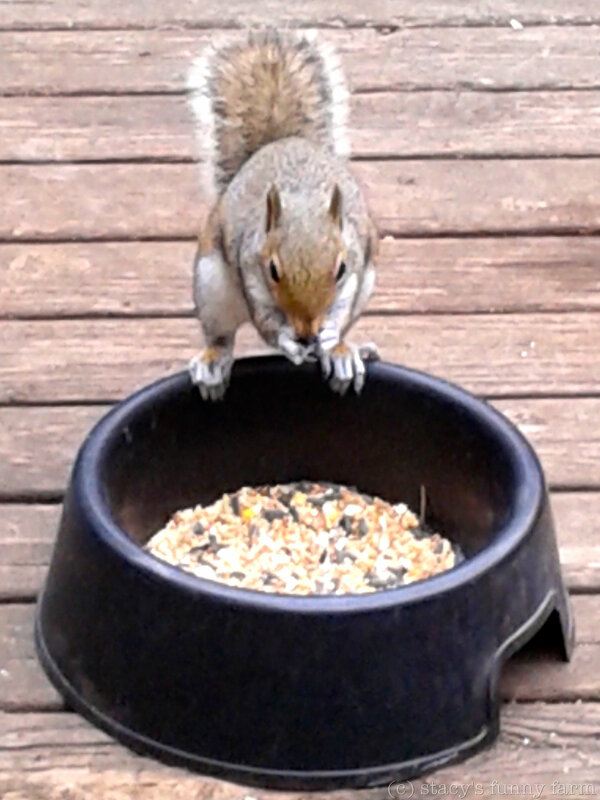 Okay, fine, I’m full of bird food right now anyway. I’m stalling a little bit because we have to use the old standby harness. It doesn’t smell right. Smells like some young punk. I just have to mark a few things, I’ll be right with you. You’re not in any hurry are you? Really? I have to wear this one? Why can’t you fix the old smelly one? The main reason why we go to the front yard is so that I can eat grass and bamboo. I’ve kind of worked it so that I get an extra corn, but I have to do tricks to get it. Sometimes I even have to do an extra trick. I have to stand on this black plastic thing. Why is it so small and slippery? It tells me whether or not I’m big and fat. I am 130, give or take 5 or 10. I’m a bouncy guy. 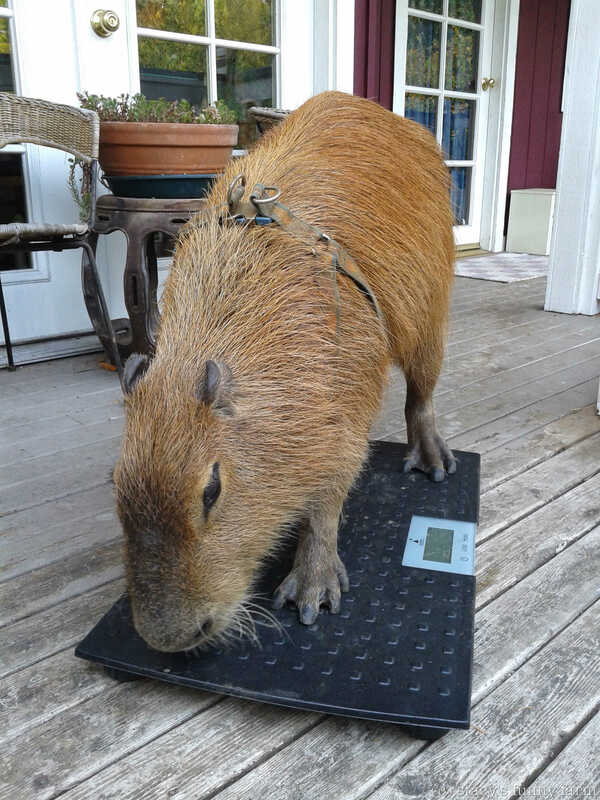 Capybaras are not built for going downhill. Time to go eat bamboo! See you later.